Many people do not realize that the ringworm, or dermatophytosis, is actually a fungal infection that is found anywhere on the body of animals and humans. According to Mayo Clinic, ringworm is one of many causes of hair loss on the scalp of humans. An infected animal sheds ringworm spores. These spores can exist in the environment, such as in mud, bedding and food, for more than 18 months. Ringworm symptoms appear within 10 to 20 days after initial contact with the fungal spores. 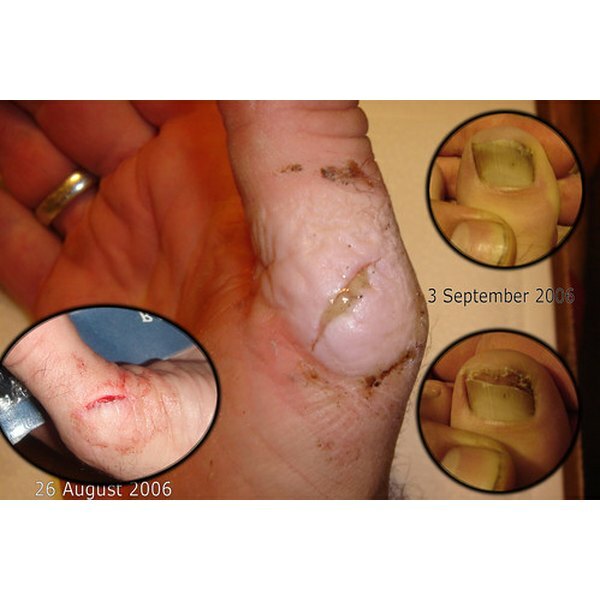 The fungal infection can develop on the body, but especially under fingernails and on feet. Ringworm skin lesions normally begin as distinctive, reddish round areas of hair loss, which may progress to reddening, thickening and loss of pigmentation to other skin areas. The Centers for Disease Control and Prevention notes that rash can be dry and scaly or wet and crusty. Infected areas must be kept clean. Treat with an over-the-counter fungal product, such as Lamasil. Prescription topical products or pills can be used to treat ringworm in severe cases. The best prevention is to avoid animals that have or are being treated for the fungal infection. Also, keep skin and feet clean and dry, shampoo regularly, wear sandals or shoes at gyms, lockers and pools, and do not share clothing, towels and personal-care items with other people. Ringworms can be transmitted to humans from pets, from one person to another by direct contact or by contaminated combs, unwashed clothing and shower or pool surfaces.